Author(s): Zhengfeng Liu, Yingdong Yang, Wugan Luo. Department of Scientific History and Archaeometry, School of Humanities, University of Chinese Academy of Sciences, Beijing, P.R. China. 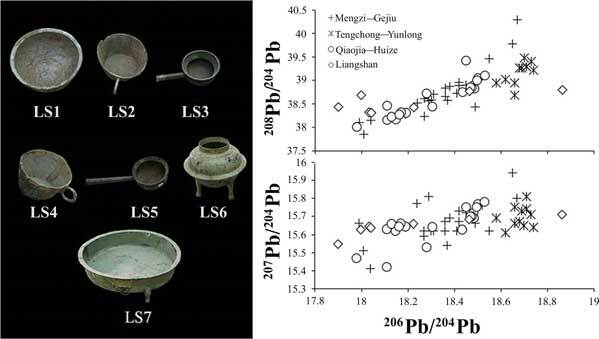 MC-ICP-MS analysis is conducted on seven Han dynasty bronze artifacts from Liangshan Yi Autonomous Prefecture Museum, Sichuan Province, Southwest China. The lead isotope ratios conform to the characteristics of the common lead. The lead ore sources are mainly located in Mengzi-Gejiu and Qiaojia-Huize area, Yunnan Province. Some lead ore was from Geochemical Province of Southern China. A further study shows the lead ores used by Ba State in the Eastern Zhou dynasty (476 BC-221 BC) were used in the Han dynasty (202 BC-221 AD). The lead ingot products were utilized in Liangshan bronze industry. Moreover, in the Han dynasty, the ancient cultures of Liangshan, Dian, Ba and Yelang were exchanged. By contrast, communications among Liangshan, Dian and Ba were closer. Keywords: Chinese bronze, cultural communication, han dynasty, lead isotope, liangshan, provenance. Affiliation:Department of Scientific History and Archaeometry, School of Humanities, University of Chinese Academy of Sciences, Beijing, P.R. China. Keywords:Chinese bronze, cultural communication, han dynasty, lead isotope, liangshan, provenance. Abstract:MC-ICP-MS analysis is conducted on seven Han dynasty bronze artifacts from Liangshan Yi Autonomous Prefecture Museum, Sichuan Province, Southwest China. The lead isotope ratios conform to the characteristics of the common lead. The lead ore sources are mainly located in Mengzi-Gejiu and Qiaojia-Huize area, Yunnan Province. Some lead ore was from Geochemical Province of Southern China. A further study shows the lead ores used by Ba State in the Eastern Zhou dynasty (476 BC-221 BC) were used in the Han dynasty (202 BC-221 AD). The lead ingot products were utilized in Liangshan bronze industry. Moreover, in the Han dynasty, the ancient cultures of Liangshan, Dian, Ba and Yelang were exchanged. By contrast, communications among Liangshan, Dian and Ba were closer.